… the headphones are excellent. I’m no audiophile, but I can appreciate a solid, rich sound and these headphones definitely deliver that. This time, the marketing superlatives on the back of the box stand up. “Amazing”, “incredible”, “quality”, “rich” and of course, we cannot forget “dynamic”. Okay, maybe this is just some marketing executive justifying his salary in difficult times. Once on, background noise is minimised. Equally, and more importantly, unless driving the headphones at exceedingly loud volumes, there is no leakage. When you are working in an office, this is essential. You don’t even need to “drive” these headphones, a perfectly adequate and safe listening experience can be had at 14/30 on a Nokia Lumia 800. If I was to have one complaint, it is the inteference with the radios of the mobile phone itself running through the wire, resulting in the inevitable blipbippbipibipibpbibibippbip. This, however, is more likely due to the design of the phone. Again, the Lumia 800 may be a beautiful phone, but elements of it just don’t work. Screening of the audio hardware seems to have been neglected. I mentioned “headaches”. The offer certainly put up “barriers of eligibility” which challenged you legally and emotionally to make sure you that you were not only eligible for the offer, but could also be bothered to complete the process. Cashback offers from HP Servers have a similarly typical onerous process, requiring all documents in place and submitted correctly for the offer to be processed. After having started the final stage of the application, by entering my IMEI into the offer web-page, I was told that the “IMEI is not valid”. Alarm bells. I then called Nokia Customer Services, who although they tried their hardest, I suspect their hardest was really nothing more than blocking my call and passing it off to another department. With the greatest respect to out-sourced call centres, this was an abonimable experience. I was told, in a heavy Indian accent, that I was speaking first to “Mike” (indeed, the only person in the entire team with that name) and then “Sophie”. After failing to explain the simplest things, including coming up with my own phonetic alphabet in a desperate attempt to spell my name (“Panda-bear”, “Language”, “Elephant” … ok, maybe I was just enjoying winding dear “Sophie” up), I was just told it would be “processed”. As with most things regarding customer service, you just need to speak to someone who knows what they are doing, have access to the correct systems and procedures and cares enough about their brand to take ownership of the problem. So I tweeted @NokiaHelps, and they took it on. Indeed, 5 days later, I now have the headphones! Lesson to all companies: if you use out-sourced call-centres do not insult my intelligence by giving people English names and make sure they are well versed with the entire customer service requirements. And make damn sure you have an alternative channel of support, in this case, Twitter. But why are they offering this rather generous promotion? 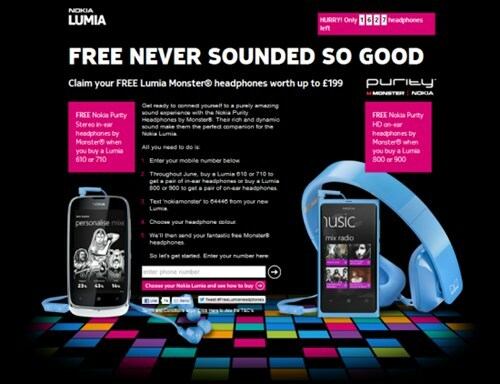 Clearly, £200 is a retail value and Nokia would not be paying anywhere near this amount to provide this promotion. But, the company is still in dire straits both financially and with regards its increasingly insignificant market position. So how can they afford it? Maybe it’s factored into a percentage of Lumia sales’ profits. Some people will buy the Lumia with no knowlege of the offer. A smaller percentage would buy the Lumia and although they know of the offer, they do not opt to use it. A smaller percentage again may apply but for whatever reason pull out, possibly due to disqualification or maybe due to the onerous requirements of the offer. That leaves a relatively small number of people whose applications may be financially viable. Another possibility could be the proximity of the Windows Phone 8 devices. Nokia have done an awesome job of marketing Windows Phone 7 and grabbing people onto their phones as opposed to the more established models of their competitors. All this, knowing that Windows Phone 8 is around the corner and probably also knowing of the limited upgrade opportunities for the current generation of handsets due to the different OS core. While the headphones are compatible with other operating systems, they are distinctly aimed at Nokia Windows Phone 7 devices – a nice change having to wade through hundreds of i*-only products. By enticing users into a distinctly Nokia-based experience and branding (even down to the 90-degree angle on the 3.5mm plug on the phone-end), maybe they are hoping to secure users’ upgrading to a Nokia Windows Phone 8 rather than a competitor’s model?